Meddbase is a feature rich and flexible automated medical billing software system to suit all organisations. It can be used for creating single invoices, group invoices and receipts to private patient or 3rd party payers. Invoices can be created automatically based on the appointment and additional services provided as part of that appointment, patient eligibility rules can also be setup. Each service offered by the clinic is associated with a cost and a code within Meddbase. The cost and code type are specified during the initial setup stages. Changes and additional items can be made or added at any time by authorised users. Meddbase hosts a number of off the shelf integrations with Accounting systems such as Xero and Reviso. For claims processing, Meddbase interfaces with HealthCode allowing a quick and simple way to generate invoices and process claims. All medical billing will be generated automatically by Meddbase and attached to the patient or company file. The bill is generated at the point the patient arrives for the appointment. If the patient does not arrive then a DNA bill can be created automatically for a specific amount or a percentage of the appointment. If a patient cancels within a specific time period, a bill can be generated for a specific amount or a percentage of the appointment. An overview of all medical billing items and invoices is accessible via Meddbase. Meddbase will produce customisable summaries and reports for invoices due, overdue and paid, and display information relating to the accounts ledger.Detailed customised reports can be run across all billing items and invoices and statements can be setup as part of the reporting service.The format of the bill can be completely customised for your organisation by displaying logos, specific billing items and a breakdown of cost if required. Authorised users are able to amend bills after they are created. 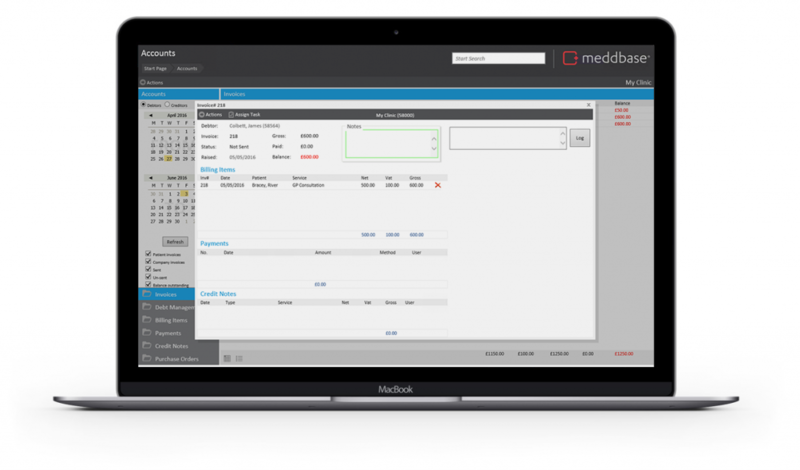 Meddbase can also create walkout statements or receipts for patients on an individual basis. Meddbase manages all incoming payments and allocates these to the invoices. Payments can be directly matched against an invoice, or alternatively a payment can be made to account and matched off against multiple invoices in one go. This is especially useful if several invoices are being paid off with one payment. Meddbase also allows you to track the location of each payment, meaning if you have more than one location taking payment, or PDQ machine, reconciling can be quick and easy. As well as standard price lists, you can setup advanced price lists within Meddbase to offer fee splits relating to the individual billing item and attending doctor. For example, you may want to provide the doctor with £30 each time a consultation is carried out, or 30% or the consultation. Each pricing structure within Meddbase allows you specify the fee split value. This can also be setup three ways. First Meddbase sets up an initial invoice which will be paid for by the patient, third party payer or even split between both. When the patient arrives, the invoice is allocated to the debtor and at the same time an invoice is raised from the attending doctor(s) to the organisation. This ensures the patient is only paying one bill, but that the fee split invoice amount is correct every time and automated.